Annet Gelink Gallery presents the installation Gallery Cover of British artist Ryan Gander (1976). The past years have showered him with praise from national and international press for his surprising and multiform manner of working. Having an incredibly productive period behind him in which he built a monumental oeuvre, Gallery Cover will be the last presentation of his work in the gallery before a one-year research period. The gallery is shrouded in an orange glow. 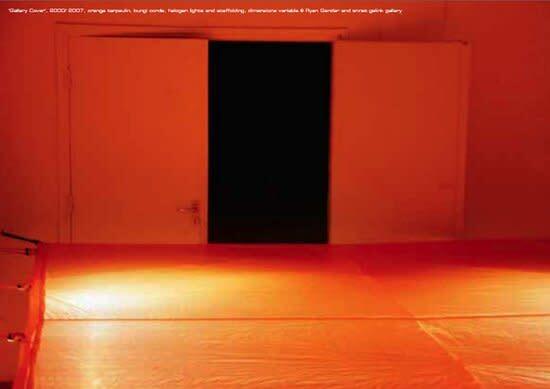 The light sources are located under an orange tarpaulin that covers the exhibition area. It would appear as though an installation or preparation for the next exhibition is taking place or as if there is a project in progress. Temporarily preventing the gallery space from being used, it is reminiscent of the covers found in swimming pools or tennis courts. Gallery Cover is an installation that toys with the spectator's expectations. With modest means Gander attempts to rouse the spectator's curiosity using the narrative potency of everyday objects and very grounded materials. On 8 March, in MUMOK, Vienna, Ryan Gander's solo exhibition Short cut through the trees will open. Recent works will also be presented in the MUMOK, including two installations: Nathaniel Knows, 2003-2007 and A Phantom of Appropriation, 2006. The exhibition will be open from 9 March - 10 June 2007.